<< Eurovision Top 250 – countdown of the most popular Eurovision songs on New Year’s Eve 31 December, 11:00 CET! 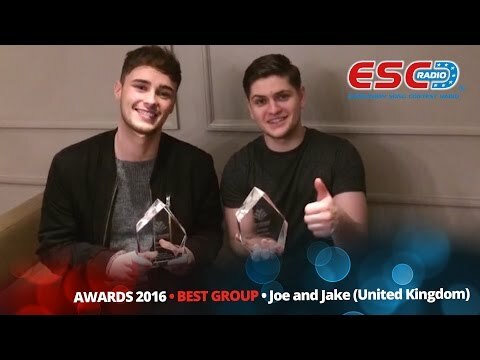 Joe and Jake, who represented the United Kingdom at the 2016 Eurovision Song Contest in Stockholm with the song “You’re Not Alone”, were the winners in this year’s ESC Radio Awards poll in the category „Best Group“. With a special video message they now want to sincerely thank all their fans who voted for them. On Saturday 21 January 2017, Joe and Jake will be performing at the OGAE Eurovision fan club meeting in Munich, Germany. Between June 25 and July 3, ESC Radio listeners and Eurovision fans had the opportunity to vote for their favourite songs and acts of the 2016 Eurovision Song Contest. Votes came in not only from the 42 participating countries, but from all corners of Europe and other parts of the world like Australia, Asia, North and South America. This entry was posted on Monday, December 19th, 2016 at 4:20 pm	and is filed under ESC Radio Awards, News. You can follow any responses to this entry through the RSS 2.0 feed. You can leave a response, or trackback from your own site.